This is the third installment of our monthly classic actress beauty tips that I have read about AND tested. This post is a bit different. The last two beauty tips I found after reading up on old actresses’ beauty secrets. This beauty tip was one I have observed being practiced by numerous actresses in films. 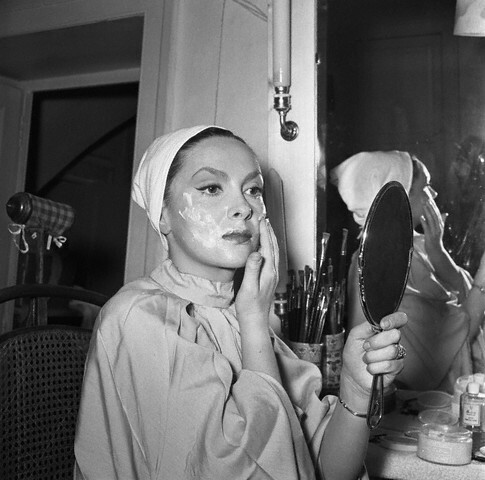 Who hasn’t seen a film that an actress is slathering her face with cold cream as she is getting ready for a night on the town, going to bed or getting a facial in an upscale salon? I know Jean Harlow has her face covered in cream as she is at a beauty parlor in “Red-Headed Woman” (1932) after working her way up in society by nabbing a rich man, and I’m sure that several women are getting facials with cold cream in the upscale beauty spa “The Women” (1939). Early in my high school years, I saw these perfect actresses with the cold cream facials and thought, “Maybe that would work for me.” I tried it a few times, found that my skin would feel softer and cleaner, but never made it part of my nightly ritual. This summer I would come home after a hot day at my internship at a newspaper feeling greasy, dirty and like my make-up was caking on my face. Previously, I read in teen magazines like “YM” that you should wash your face twice: once to get off the make-up and once to clean the skin. (I generally just wash my face with plain soap and water-either Ivory soap or a gentle Neutrogena bar soap). Even after washing my face twice I still was breaking out and felt dirty. I remembered the actresses cleaning their skin with cold cream and decided to do the same. 1.) Find a jar of cold cream. A large jar is probably $5 or $6, but it lasts forever. I use Pond’s Cool Cucumber Classic; it’s very smooth, creamy and has a very light scent. 2.) 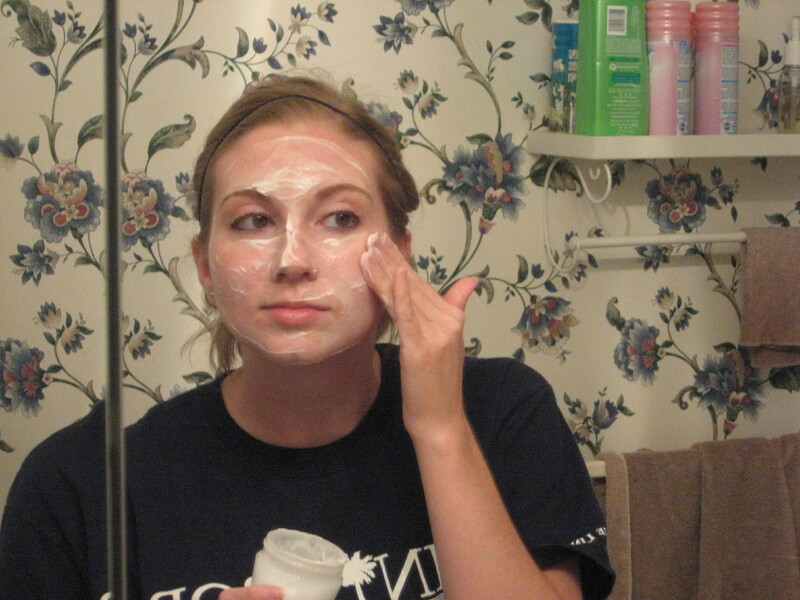 With your skin dry, lather your face up with cold cream. I apply it pretty liberally in order to have enough to rub into my skin. 3.) Rub, pat and smooth the cold cream on your skin. If I’m washing it off immediately I sometimes close my eyes and rub it over my eyelashes to get eyeliner and mascara off. 4.) Rub the cold cream into your skin as long as you want. It’s not going to sink in like lotion. I generally rub it until it turns to a slick, greasy consistency. 5.) Wipe or wash off. If you simply wipe your face with a dry tissue or wash cloth, you will still feel greasy depending on your skin type. I have oily skin so I wash off the cold cream. 6.) After washing off the cold cream, I follow-up with a second washing to make sure all cold cream and make-up residue is gone. 7.) Your skin will be left feeling fresh, clean and soft. To Review: After cleansing with cold cream almost every day this summer, my skin has been clearer and smoother. I was in Minneapolis, M.N. for a few days last week and came home broken out. My skin is pretty sensitive, so sometimes water in different areas in the country causes me to break out. 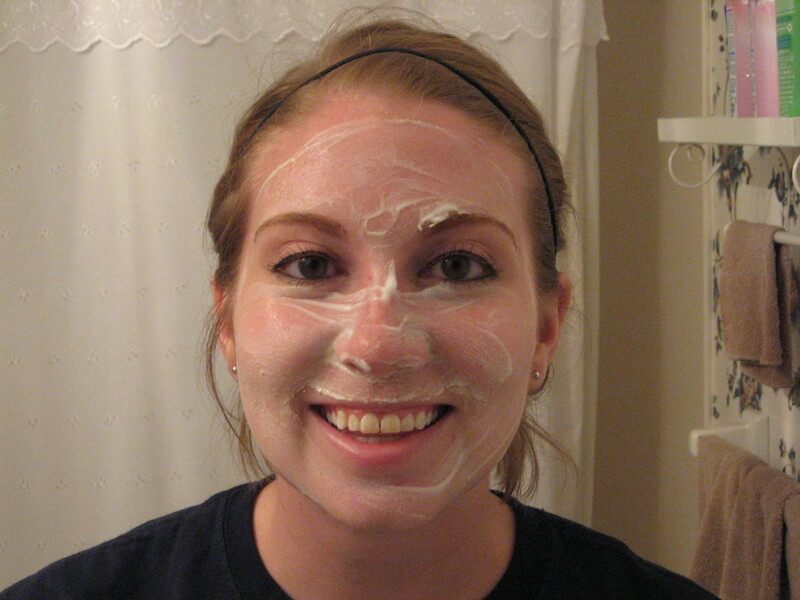 When I came home, I lathered up with cold cream and scrubbed with Boraxo and was back to normal. Check back September 1 for the next beauty tip! P.S. I have to apologize for not giving an update for on a follow up test of champagne hair rinsing. I might do a mid-month beauty tip and a half for that. I haven’t had a chance to test it again, sorry guys.